Distributor for oil model ZEM for system volumetric (PDI), 1 input and 5 outputs 040 cc/cycle-in/out, max. 45 bar, with fittings for quick connection. lubricant. Which means that there is nothing to worry about or under lubrication. The injector series ZEM are PDIs, classic, reliable, and accurate. 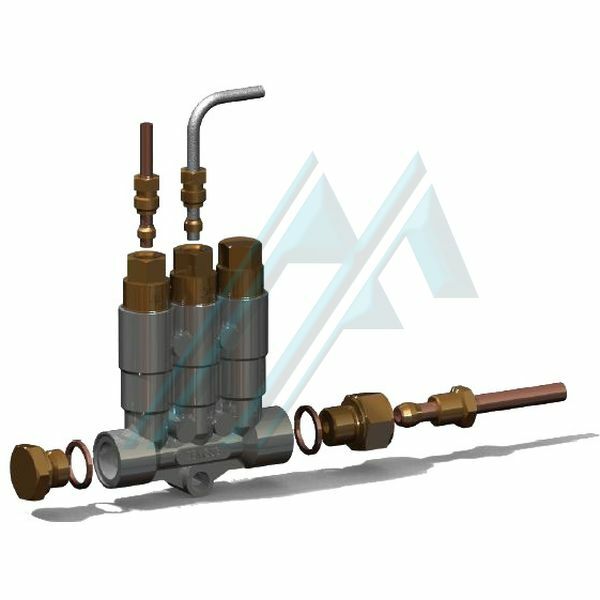 When the pressure builds up in the manifold, the piston in the injector moves forward, discharging a set amount of lubricant to the lubrication point. While it relieves the pressure, a compression spring re-place the piston in its original position. This movement recharges the injector (camera download) and the injector is ready for the next phase cycle. It is important to note that the lubrication pump used with the injector series ZEM should increase the pressure to a minimum 15 bars (220 psi) to activate the discharge of the injector. The operation recommended pressure is 21 bars (300 psi). 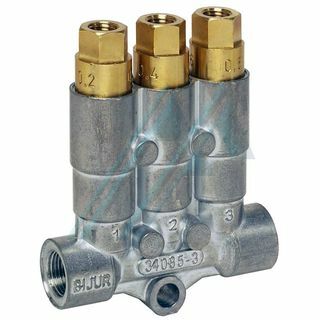 Also requires a pressure relief valve to quickly reduce the pressure in the pipe between 0.3 and 0.7 bar (5 to 11 psi) cycles between lubrication. This allows the injector to fully re-charge. Handles oils and fats soft. Ten volumes of output are available for a wide range of applications and points. The modular design of the injectors is mounted in the binding for easy installation on the machine. Possibility of incorporating different injectors in series on the same system. Each series is available with fittings push to connect or compression fittings standard. Pressure: Maximum operating: 45 bar (650 psi). Operation minimum: 15 bars (220 psi). Alleviating 0.7 bar (11 psi). Volume of supply: 0.40 cc.